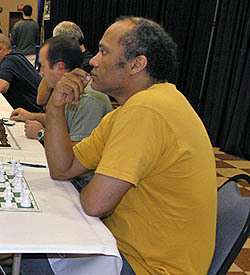 Emory Tate is regular figure on "Fire on Board" because if anyone's games are illustrative of fire, it is his. This game was interesting and shows (again) what a danger he came be when he gets an attack rolling. In this game he faces 15-year old phenom Salvijus Bercys, an International Master. Tate springs a couple of inventive ideas 7.Qe2!? and 10.Bh3! to throw the game into massive complications. Bercys played several moves to stave off the attack, but like a lion stalking a gazelle, Tate kept up the pressure. Notes are by Emory Tate and came from the audio recording. You can hear the recording here as you go over the game and notes or view the gamecast here. "IM Emory Tate - IM Salvijus Bercys"